On Thursday 28th January 2016, more than 50 people from Kratie and Stung treng provinces, as well as government officials and the country director of WWF-Cambodia gathered at the Kampi River Guard outpost for an official hand-over of new equipment for the river guards that protect the area. This event, held in collaboration with the FiA (Fishery Administration), aimed to celebrate the work of the river guards and present them with new uniforms and equipment (walkie-talkies, torches and headlights), essential for their work patrolling this stretch of the Mekong River. It was also an important an event to look more closely at the work of the river guards and see how improvements could be made to support this and ensure the crack down on illegal activities could be carried out effectively. The work of the river guards is of vital importance in protecting significant populations of fish and the critically endangered Irrawaddy Dolphin in Cambodia. There are still considerable levels of illegal fishing that take place along the stretch of river between Kratie and Stung treng provinces and it is the work of the river guards to try and prevent this; and in turn support the wildlife conservation efforts put in place by WWF-Cambodia. Gillnets are still used in some protected areas and electro-fishing methods practiced, and it is up to the river guards to confiscate such equipment and ensure this does not occur. Catching the perpetrators however, and sending them to court can often be a difficult process. “WWF-Cambodia is very concerned about the welfare of the Irrawaddy dolphins and is committed to supporting the necessary patrol equipment like boats, engines and walkie-talkies for the use of the river guards. We also need to talk both nationally and internationally about the drastic consequences that the completion of the Don Sahong Dam will have on the dolphins and on the future livelihoods of the river guards that rely on this stretch of river”, said Mr Chhith Sam Ath, WWF-Cambodia Country Director. The event, which started at 8am at the Kampi River Guard outpost, was a very important opportunity to discuss the challenges faced by the river guards and how to improve on their work; as well as presenting much needed equipment to the teams. The river guard chiefs from both Kratie and Stung Treng provinces, Mr Mok Ponlok and Mr Deab Bora, started with speeches on recent law enforcement activities in their respective provinces. They highlighted the recent success in the prevention of illegal fishing and poaching activities, whereby 16 poachers were sent to court and more than 350 gillnets were confiscated. 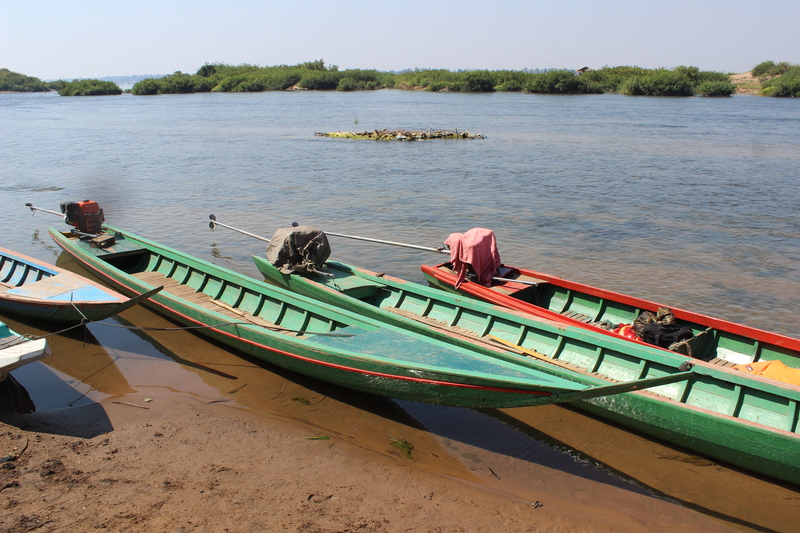 Some of the biggest challenges faced by the river guards in their daily work were also brought to light and there was a consensus between both outposts, that too few river guards patrolled each area and were not paid enough for their work. They also flagged the need for a new outpost to be built for the Keng Brasat river guard team. WWF-Cambodia and the FiA have been closely supporting the river guards’ work since October 2013; when the management of the river guards was officially transferred over from the Dolphin Commission. Both WWF-Cambodia and the FiA are committed to the work of the river guards and will continue to support these efforts in cracking down on illegal activities along the Mekong River. They both also recognize that a special effort needs to be made to monitor and protect the areas where the endangered Irrawaddy Dolphins are known to go. “The river guards do a very important job and we need to keep them safe and help them to be more efficient through the continuous funding from WWF-Cambodia and the state’’ said, Mr Ouk Vibol, Fisheries Conservation Director at FiA. 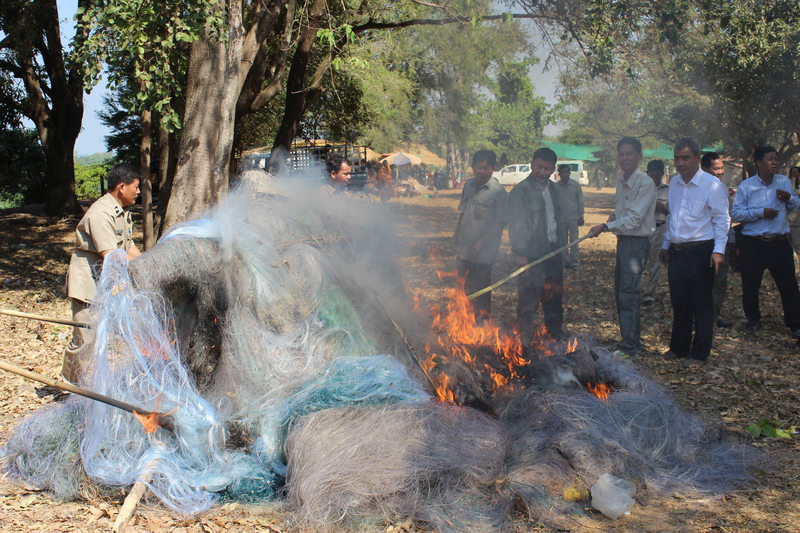 After the speeches, the equipment and uniforms were handed over to the river guards, and a large pile of gillnets and confiscated illegal fishing equipment (used for electro-fishing) was set on fire as a symbolic gesture. It also ensure that the equipment would never be used again. 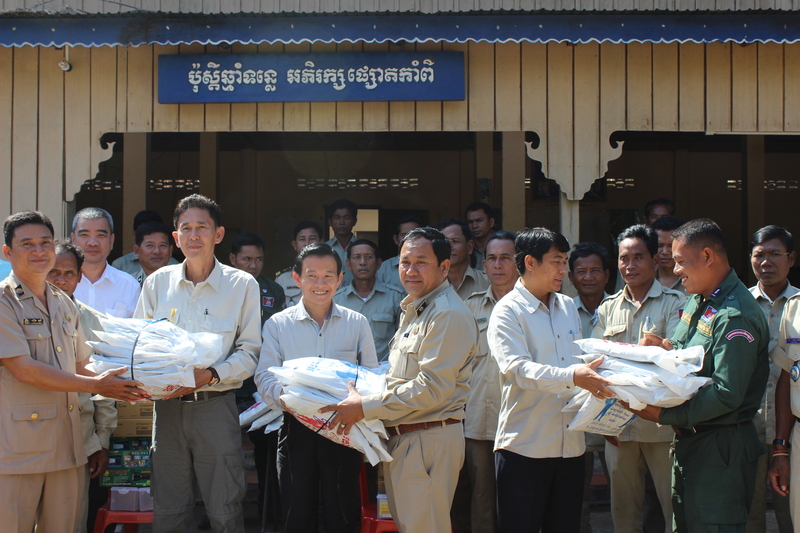 FiA kindly provided the uniforms and the rest of the equipment was provided by WWF-Cambodia. The new equipment that was presented will definitely go some way in combatting the challenges faced, but a lot more needs to be done to allow the river guards to carry out their work most effectively. Overall, this was a very successful event, highlighting the recent successes of the river guards as well as many areas that need to be addressed. The teams went away with a positive outlook for the future, and with the ongoing support from WWF-Cambodia and the FiA hopefully the work of the river guards will continue to protect the dolphins and crack down on illegal activities in the river.